Bom•bay (bm-b) N. City of west-central India on coastal Mumbai Island & adjacent Salsette Island. India's main port & commercial center. Quiz (kwz) V. 1.Question closely or repeatedly. 2.Test the knowledge of by posing questions. 3.Poke fun at; mock. Club (klb) N. 1.Stout stick, thicker at one end, for use as a weapon. 2.Black figure shaped like a trefoil on certain playing cards. 3.Group of people organized for a common purpose, especially a group that meets regularly. The Bombay Quiz Club is proud to associate with The Hindu Group on Cerebration - The Hindu BusinessLine Quiz. After successful runs in Delhi, Chennai and Bengaluru, Cerebration will come to Mumbai on Saturday, 23 September. It will be a 2-member-team Business Quiz, with the 2 contestants necessarily being from the same educational institution or organisation. There is no geographical restriction, so do feel free to come in from other locations as well. Ramada Plaza Palm Grove adjoins the picturesque (and of late immensely clean) Juhu Chowpatty, and a weekend there could be an added attraction. Please register online on www.cerebration.co.in. The "normal" quizzes are for teams of 3 and the "written" ones for teams of two. Hope to see you and your friends here to have a great time courtesy the Bombay Quiz Club. After a very successful Mumbai Quiz Festival in February and with the Mumbai edition of the Landmark Quiz happening on May 1, a Friday, the Bombay Quiz Club will be hosting May Fever - the Quiz Fest on Saturday and Sunday May 2 and 3. The venue is the General Auditorium at the SIES College of Arts and Sciences in Sion, Mumbai. There will be 4 full length open quizzes over the 2 days - The Printer's Devil (Literature and Books) Quiz, an AV quiz, A General Quiz and a Movies Quiz . All quizzes are for teams of three, have a prelims and a finals and are open to all. There is also a Sharaab, Shabaab Aur Kabaab quiz by Vibhendu Tewari, Venkatraghavan Sahasranaman, Shubhankar Gokhale and Anannya Deb. May 2nd, 2015. 7 pm onwards, Rajyog Family Restaurant & Bar, Bandra East following the regular 2 quizzes for the day. We have over Rs.45,000 in prize money on offer! Where: General Auditorium at the SIES College of Arts and Sciences in Sion, Mumbai. Put a sticky note on 10/5 on your calendar. Here comes Soliloquiz ( "Sololikhoquiz" for those who don't dig classical languages! ). May 10th at 3 pm in India. Solo quiz. No question papers. All questions on screen. Short questions. Lots of visuals. 63 questions. 2 hours with a 20 minute break in between. Quizmasters from quiz clubs all over India. J KrishnamurthiRemember to read the sticky note on 9/5 ! Quizmaster: Various Artists When: 3 PM, Sunday, 10th May 2015 (Please be there by 2:45 PM for team assignments) Where: Pinstorm, Ground Floor, Swati House (Next to Kotak Bank on Linking Road), North Avenue, Santa Cruz (W). Directions: From the south: If you come north on Linking Road from Bandra to SantaCruz, you'll find a large Benetton Store on the right. At the end of that block is a Kotak Bank at the corner. Take a right and it's the next building, take the first gate and tell the sentry you've come for the quiz. From the north: If you get on to Linking Road at the airplane park end, you'll cross a HDFC Bank. A block later, you'll see a Kotak Bank on the corner - do not cross it. Take a left at that point and it's the building next to Kotak Bank. As we get set for the Landmark and May Fever quizzes on the first weekend of May, BQC President Anannya Deb brings us some push-up material from his quizzing cornucopia. On Dada's menu this time is the quiz he conducted in Pune on behalf of the Boat Club Quiz Club, which he has agreed to re-run for those of us across the Expressway. For those of you who are yet to attend a Dada quiz, the range of subjects he straddles effortlessly is bound to leave you awestruck, and you will surely leave the quiz much enriched. Quizmaster: Anannya Deb When: 3 PM, Sunday, 26th april 2015 (Please be there by 2:45 PM for team assignments) Where: Pinstorm, Ground Floor, Swati House (Next to Kotak Bank on Linking Road), North Avenue, Santa Cruz (W). 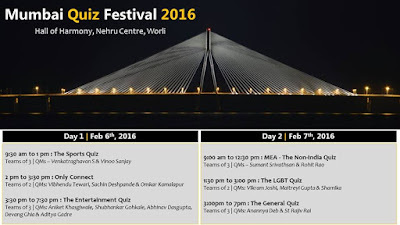 All the Quizzes at MQF 2015. If you win all the quizzes (unlikely but suppose you do) and you split the money equitably with your team mates, you can get Rs 12,600 over two days of quizzing. Or take the other extreme. You make it to the final of all the four quizzes but you finish 4th. You get Rs 1,200. That will cover your Uber cab fare to and fro. Or a 30 ml shot of Johnny Walker at The Jewel of India across the corridor. Or 3 khambas of Old Monk from the nearest wine shop at Worli Naka. That's how awesome our quizzes are. Like the finest single malt or dark rum around. The location of the Mumbai Quiz Festival is the auditorium in Hall of Harmony at the Nehru Science Center on Annie Besant Road in Worli, Mumbai. -- From the outstation railway stations at Dadar, Bandra, Kurla or CST, take a taxi to the venue in Worli, Mumbai. -- If you're taking the city trains, the closest station is Mahalaxmi on the Western Railway line. Take a cab from there to the venue in Worli, Mumbai. We hope to see you there on Saturday. 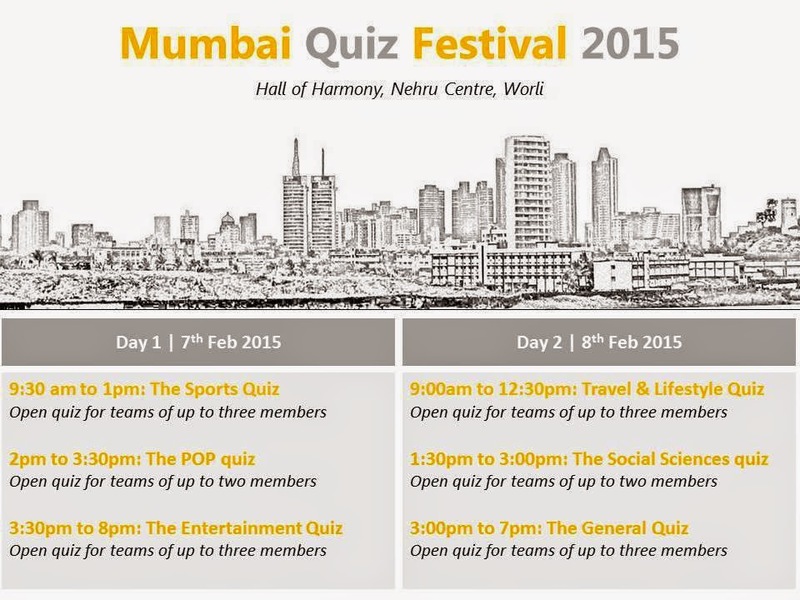 The annual Mumbai Quiz Festival is back on the 7th and 8th of February 2015 - with the venue remaining the same as last year; The Hall of Harmony at the Nehru Centre in Worli, Mumbai. 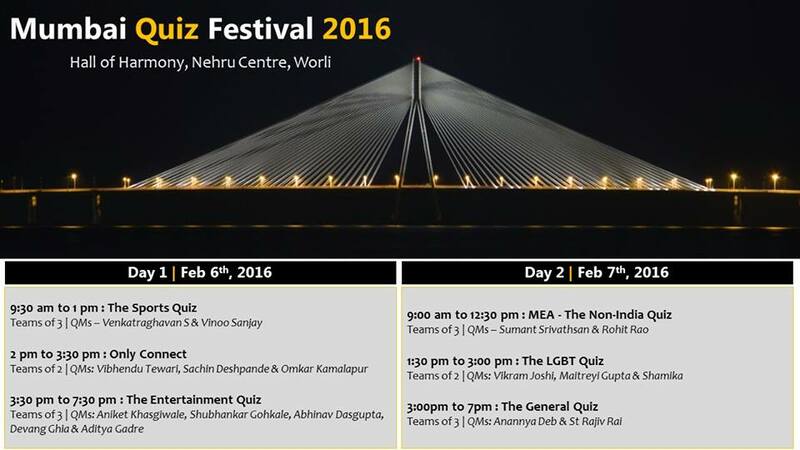 We have an awesome line-up of 6 quizzes over the 2 days with more than 1 lakh Rs. cash prizes (not "worth", no "vouchers) - actual cash. There are also 2 smaller written quizzes. More details on them will be shared in a week. All quizzes are open to everyone. Team size is upto 3 members per team. Don't worry if you don't have a full team - do come, we'll find you people to partner with. More details coming up. This is primarily to allow you and your quizzer friends to take advantage of any airline sales for that period.. The penultimate quiz of 2014 will be brought from overseas. The BQC will host the IR round of the Asean Quiz championship which was held last month in Manila. The Questions having been contributed by over 40 quizmasters across the world and collated by BQC veteran Rajiv Rai, It has world class written all over it. 90 top questions to keep you interested on an on an otherwise event-less Sunday. The quiz was meant for teams of 4, but we will employ our usual BQC quizsaathi algorithm, so all you need to do is just show up. For all those planning to resolve to attend quizzes from 2015, take a little head start, there’s no better quiz than this one for it. When: 3 PM, Sunday, 20 September, 2009 (Please be there by 2:45 PM for team assignments) Where: Pinstorm, Ground Floor, Swati House (Next to Kotak Bank on Linking Road), North Avenue, Santa Cruz (W).